Aid & Abet has a collaborative and participatory approach that enables groups to work together and explore everyday life through creative activity. Our projects make visible the artistic process and engage audiences in the ideas that fuel creative experimentation and cultural exploration. Our projects are centred around building relationships between artists, artworks and audiences therefore we consider them as ‘social sculptures’ contributing to the conversations that transform and shape our communities. 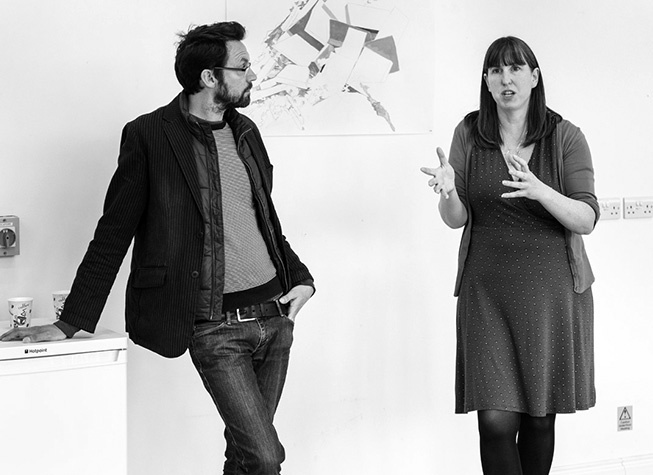 Aid & Abet place artistic process at the centre of the projects it develops and the relationships that creative practice can enable between collaborators, contributors and communities. Aid & Abet envisages its projects as artworks inclusive of all aspects; from the curatorial vision to the relationships formed, the artworks produced and the documentation of the process. Aid & Abet was conceived by a group of five artists who all had studios together at Wysing Arts Centre in Cambridgeshire. In 2011 Sarah Evans, CJ Mahony and David Kefford formed Aid & Abet as a not-for-profit organisation and established an artist-run project space in an old railway warehouse in Cambridge as part of the CB1 public art programme. The project space delivered a varied multi-disciplinary contemporary arts programme and worked with a wide range of artists at different stages of their careers for three years between 2011-2014. Since 2014 Aid & Abet, led by Evans and Kefford, have taken a new direction, shifting the model from arts organisation to artist group working on multiple projects including a year-long residency at The University of Cambridge’s North West Cambridge Development, and leading an artist residency, The Frontier Zone, in Wisbech Cambridgeshire. Aid & Abet are currently artists in residence in a studio at Mill Park, Cambridge as part of the CB1 development where we continue to host a programme of workshops, talks, and events for a public audience. We facilitate an engagement programme across Cambridge for all the artists commissioned as part of the public art programme, including Jaqualine Poncelet, Troika, Jyll Bradley and Gavin Turk. Aid & Abet have recently been commissioned by Trust New Art as lead artists and will be developing a major new work for Peckover House in Wisbech in 2018.